Reason: Cleanup, style consistency and organization. This book by Richard Bozulich and Rob van Zeijst is volume 3 of the Kiseido Mastering the Basics series. See also BQM220 regarding Problem 133. The Efficiency of Stones illustrates the major concepts of efficiency via examples from play, concentrating on dumplings, empty triangles, heavy stones and over-concentrated stones as shapes to avoid, thickness and sabaki as techniques to obtain good results. Examples of Good Shape contains a 45 page exposition on elements that are good shape and can be combined to create even better results. Elements covered include: ponnuki, mouth shape, bamboo joint, diagonal move, one-space jump, solid connection vs hanging connection, knight's move, diagonal jump, magari among others. 245 Problems consists of sets of 9 problems presented on a right hand (odd numbered) page with solutions on the overleaf and next several pages. Each solution consists of at least two diagrams illustrating the correct solution and a failure diagrams. Variation and continuation diagrams are included as needed. Occasionally a problem gives rise to a position covered in 1001 Life and Death Problems, in that case the problem number in that book is referenced. Example Games covers the hundred moves of two professional games to illustrate the principles of shape as applied in practice. A Black stone is in atari. How should Black play (to make good shape) ? 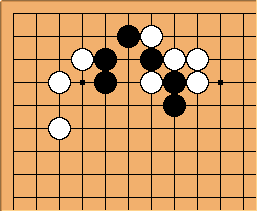 How can Black make shape for his stones? Adum: As this book was written by two amateur players, I thought it would be interesting to show it to a professional. I showed four problems to JiangMingjiu. Two were deemed correct. One (problem 158) he said there were several possibilities, and the given move was possible but probably not optimal. The final problem (problem 4) is simply wrong. The correct answer is kosumi from the 3-rd line stone. In summary, read this book with a grain of salt. There are some good ideas, but most problems have multiple solutions, and some are just wrong. How can Black keep White's stones heavy? Black should jump to 1 in Dia. 1, threatening to capture the two white stones at the top. 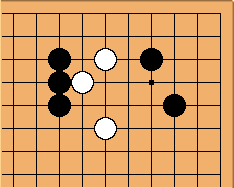 If White defends with 2, Black extends to 3, increasing his thickness and keeping the white stones heavy and under attack. Black can cut the marked stone off. Leela Zero does not care. If White defends with the diagonal move of 2 in Dia. 2, Black draws back to 3, threatening to play at A and linking up his stones. is one suggestion by Leela Zero. This is Leela Zero's other suggestion. Is one reason for Mingjiu's move the threat of ? Darrell I've corrected the diagrams to match the book, added the actual problem statement, added the second diagram and added the commentary. These clearly show that the answer was no typo. 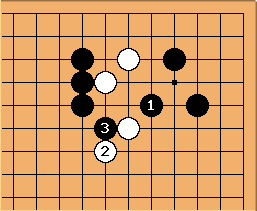 Also shows that while Mingjiu may have a better overall play, his answer does not solve the problem - make white's stones heavy. 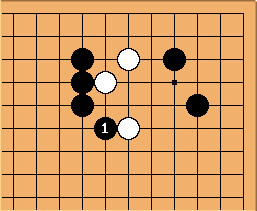 Uberdude: Or perhaps Mingjiu recognised that white is already heavy. 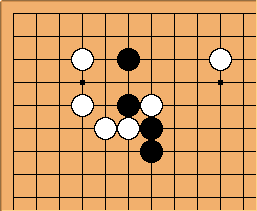 I like his move as it grows the right side in strong shape whereas the book move leaves weakness such as peeping the one point jump formed by the book move or attaching to the 5-3 stone. 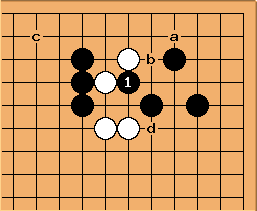 If white plays the way you suggested after Mingjui's kosumi, black might counterattack with the tesuji-combination of 1 and 3, making a and b miai. 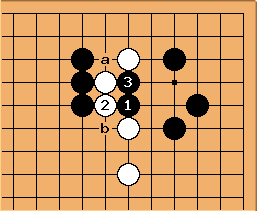 If Black dislikes the bad aji after white connects at b and black cuts at a, he can also cut at b before 3 and then, when white plays at the point below b, play 3. 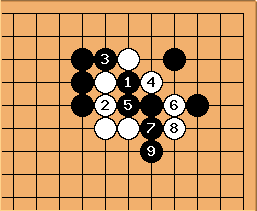 In that case, white get's better shape in the center and black has less aji as long as two stones are in atari. 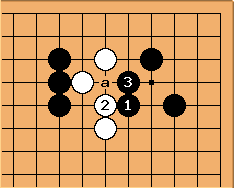 In any case, even if the resulting position, with black getting profit in gote and white getting good shape in the center, is uninteresting for black, he will leave this posibility for later on, and therefor white has bad aji if he plays the one-point-jump. slightly better shape for white? 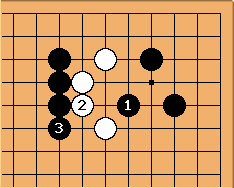 Because of this, white might prefer to play kosumi at 2 in order to strengthen his connection, and this seems to be the best sequence for both. In order to analyse this in more detail, take a look at the following diagram. If black plays the move that is suggested in the book, white 2 is a solid answer. if you compare this diagram to the previous one, it's obvious that the black stone at 1 would be better positioned at "a". 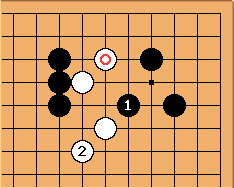 If after this, black presses at b, white can escape to the right side. 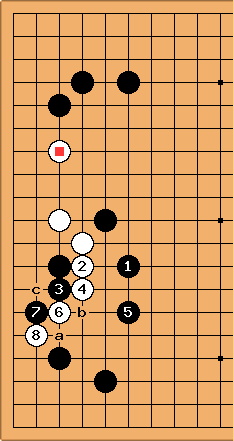 The point is that the exchange of 1 for 2, although it makes white a bit heavy, doesn't give black as much territory as Mingjui's kosumi did. 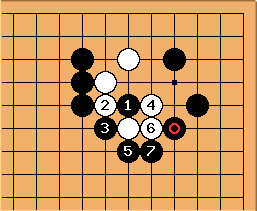 The cut of black 1 leaves very much bad aji. White can play a or b and aim at the corner, and even if white does nothing at all, c on the top is white's sente. D is also a good point if white wants influence on the right side. White can cut at 4 to make Sabaki. In any case, this is too much bad aji, so black's cut seems to be irregular. White can also consider 2 after 1, but he must be prepared for the violent cut of black 3, and needless to say, this depends on the overall position. 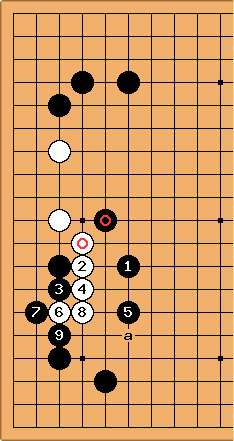 In conclusion Mingjui's kosumi seems more stable to me as it takes profit while attacking. White's shape is already thin and in cases like this it's usually better to aim at the opponent's thinness from a distance. 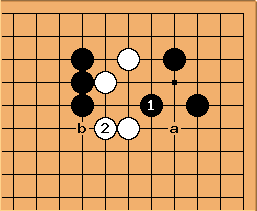 jeffguy: Black has just played the marked stone and white responded with the marked stone. On page 50, the author explains that this white marked stone is the exact response he'd hoped for. "Black continues the attack with 1 in Diagram 5. 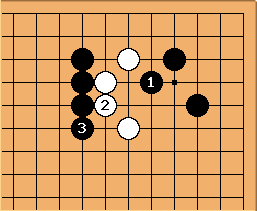 If White persists in escaping with 2 to 8, Black secures the lower left with 9. In the process he has built influence facing the center. The important thing to notice here is that White has been unable to make eye shape. By escaping, he has only helped Black. It seems as if White might be able to counterattack at 'a', but this would only help Black build a thicker position in the center." 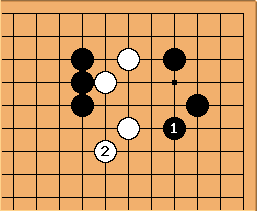 jeffguy: At this point, if Black cuts at 'a', white defends, and if Black captures , Black captures two stones, will surely live, and may escape to the center via . But what alternative does black have to 'a'? Try to live small with his three stones? I don't understand why in the book White pulled back with b instead of hane at . fractic: After the exchange of a for b Black does not need to capture directly. 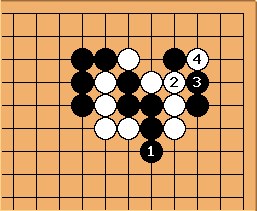 Instead Black can connect at c. In this variation is a waste, therefore connecting at b right away is better.